You’ll recall I’ve been making noises about running over to Northeastern Ohio. We decided yesterday was the day. Subject of trip? 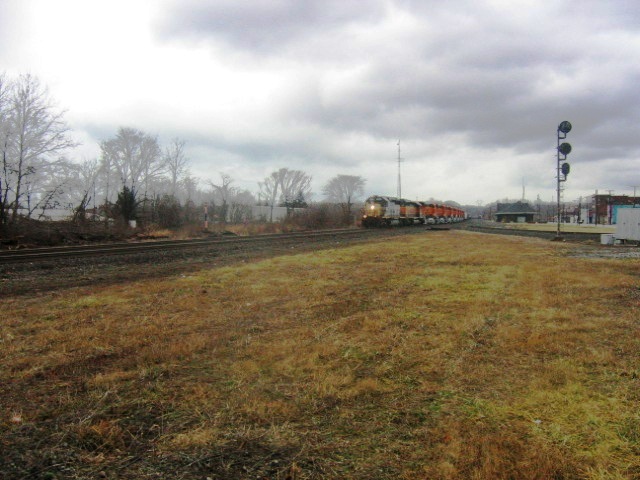 Railfanning, and Lighthouses. My wife is into lighthouses, and the boys are into trains. The southern and eastern shores of Lake Erie, provide plenty of both. And, the weather, warm as it’s been, did not show any signs of giving us any serious difficulties. So at about 6am we were on the road west. The weather forecast showed rain showers moving through, along with what it called “occasional high winds”. Those occasional high winds (45-50mph gusts) faced us all away from Rochester down to Erie and a little beyond. Given I have a high profile van, this did not help my gas mileage. You could see spots all on the way, where it had been raining hard; flooded yards , high running streams, and so on. Nothing unpassable, however. So, down I-90. first stop, Ashtabula OH. It’s about 3 and a half hours out of Rochester, and therefore well within a daytrip run, if you have a weekend, so you can rest up the day after the trip. It’s a coal town. Which means, when there’s a lake around, lots of shipping… (Read that…”Lighthouses”…) and lots of trains. As you can tell, I had the zoom at the limit for this one, and yes, I had to play with the color a bit to get the lighthouse to pop a little. As I suppose you can imagine, giving out to this thing was something of an impossibility, given the weather. We didn’t bother. The light itself has some interesting history, which you can read about here. The light is still active today, if automated. 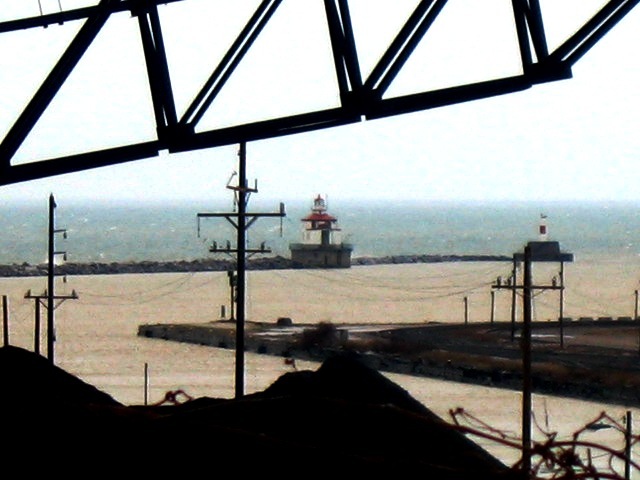 Matter of fact this was the last manned light on Lake Erie at the time it was automated in 1973. 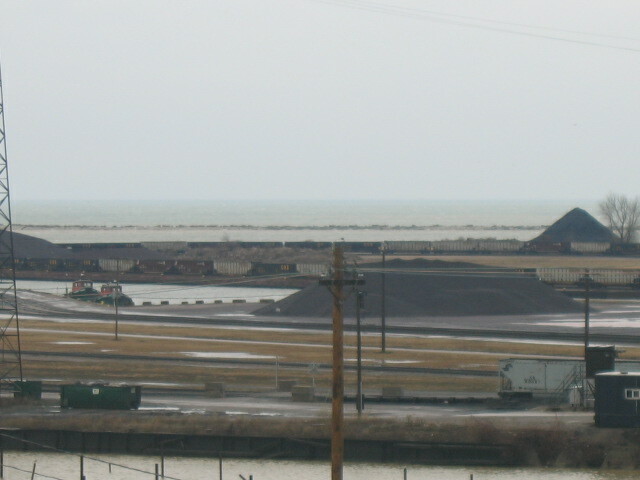 As you can see, this is a major supplier for the area’s coal. All those loaded coal cars means there’s a LOT of rail traffic around here, though not quite so much in the winter months. 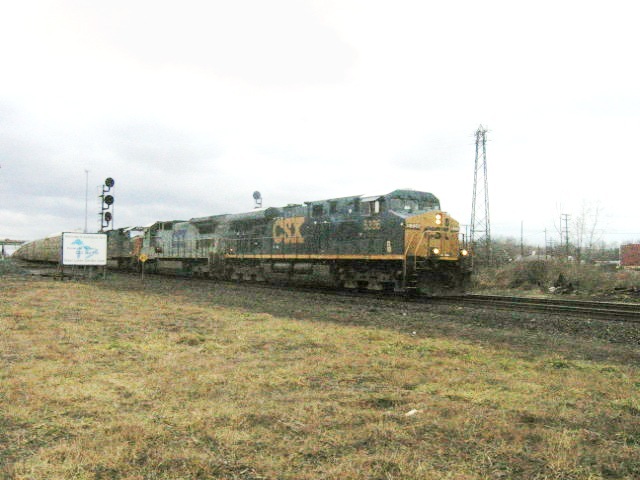 We decided to check out the CSX Chicago line, which runs through here, on it’s way past our house in Rochester. 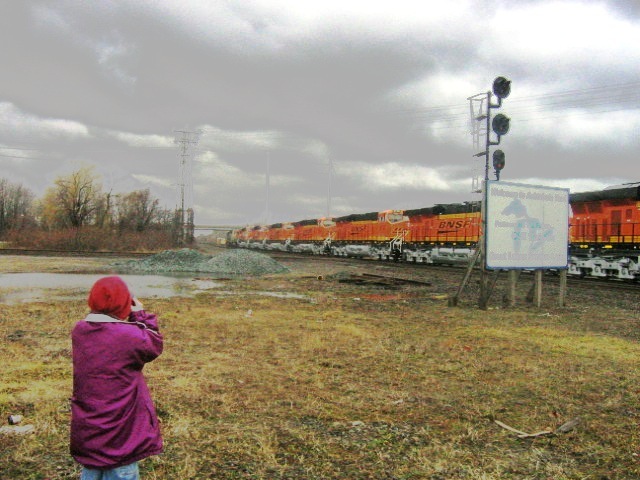 We found a spot which actually has a rare sight in modern railroading: A “Diamond”. This is a rail over rail crossing… where two rail lines or more cross each other at or near right angles. 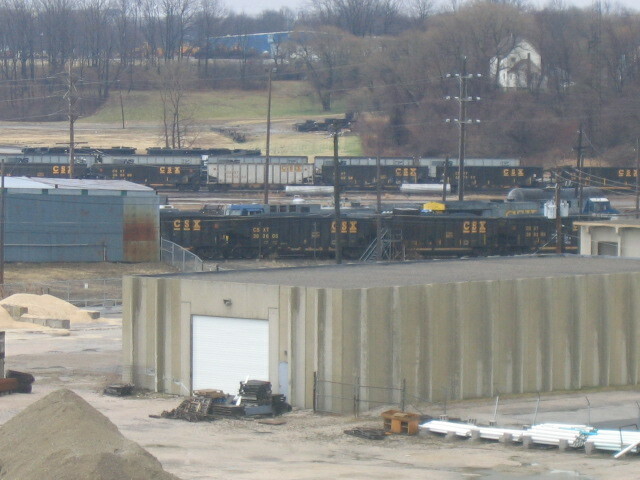 This is just to the west of the CSX Ashtabula yards. The heavy traffic reputation that this neighborhood has, proved fully justified one after setting in the area for less than five minutes the first train came along. Now, look closely at the second of the power units; This is the kind of chance rarity that the rail photo buff lives for: older power, and rare paint schemes. This particular scheme is called CSX Phase II. Or, sometimes, the “Grey Ghost”. This particular unit… C40-8, CSX7588, they apparently decided not to paint in their newer paint schemes, thinking they’d be taking it out of service before long. Of course that choice was made quite a while ago, and despite the predictions of it’s demise, the thing continues on… only one of two of that type that are left in operation. This unit has beaten the odds. By the way, Roger posts quite a bit at RAILFAN.NET.I’ve seen his name before, attached to some fine work. There was something of a theme of unexpected surprises on this trip. 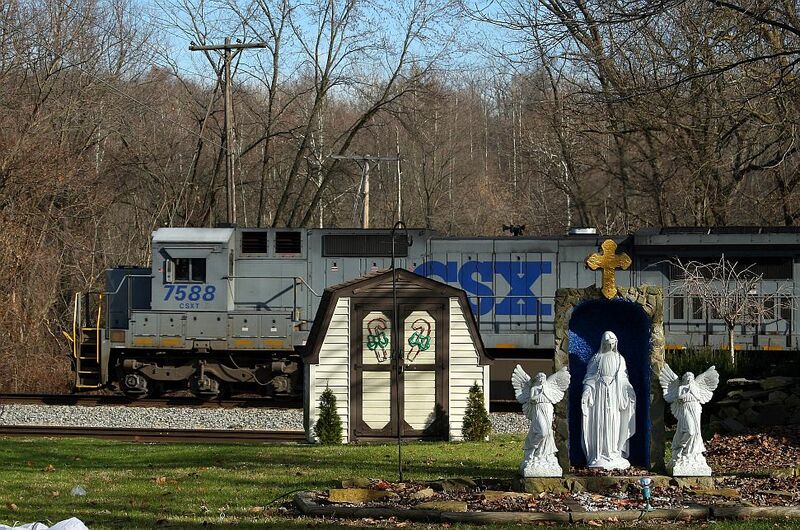 If you’re a railfan, you generally don’t really know what you’re dealing with, until it’s next to you. The very next train, around 10 minutes later, turned out to be no exception. The unit on the point… an old CSX SD40-2 8068, in Yellow Nose paint, was a clue we might have something out of the ordinary, here. Unusually, when pressed into mainline service anymore, these older units don’t get to be in the lead, or ‘on the point’, as this one was. The second clue was a splash of bright, freshly painted orange and silver, on something a fair bit larger than the point power. 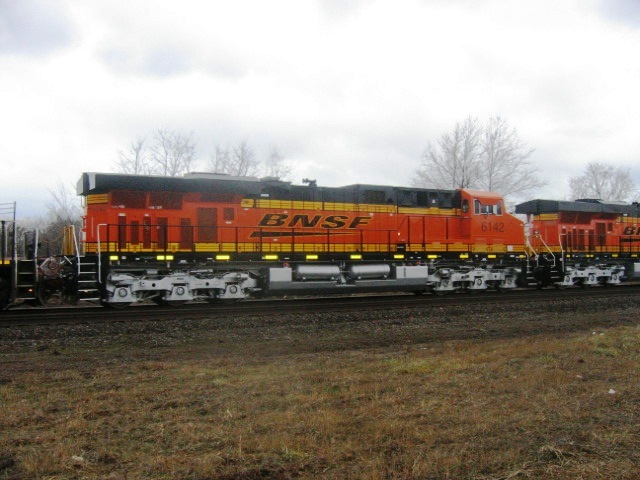 As it turned out, this seemingly nondescript train held rail photography gold: a string of brand seven new General Electric units, in BNSF’s bright orange livery, on their very first run. 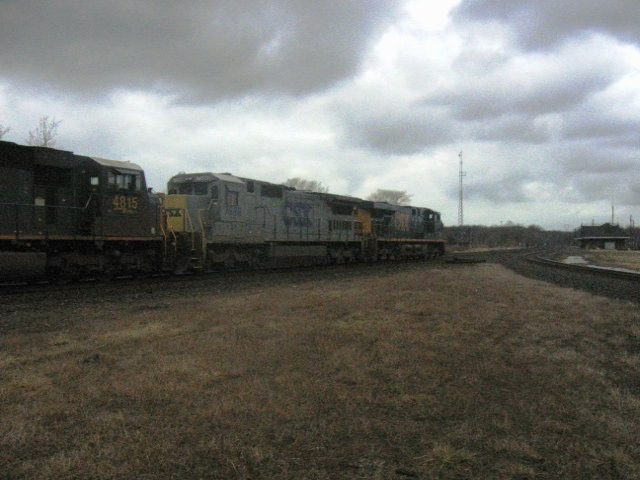 These were being taken from the GE plant over at Erie to their delivery point in the BNSF system. When Burlington northern merged with what was left of the Santa Fe system they went through a few generations of “brand paint” as well. This is their latest, and by all accounts, will be the one they go with for a few years. Each one of these new units houses around 4500 horsepower. Add to it the 3000 or so horsepower each, of the two lead units and you’re talking about 37,500 horsepower at the disposal of the guy running the train… and a rather pleasing rumble. Even taken individually, these new units from GE are an engineering marvel… Their fuel efficiency, reliability, and just all around usefulness, have made them a modern day staple in American railroading. Some environmentalists will complain that diesels make too much smoke, etc., but the electronic controls on this thing along with fuel efficiency, given the lowest amount of smoke I’ve ever seen a out of any Diesel powered Loco..
That’s my younger boy, Alex out in front, who got a smile, a wave and a ‘toot’ from the hogger. From there we went to lunch, and up through Coneaut, OH on our way back to Erie, to the north and east. 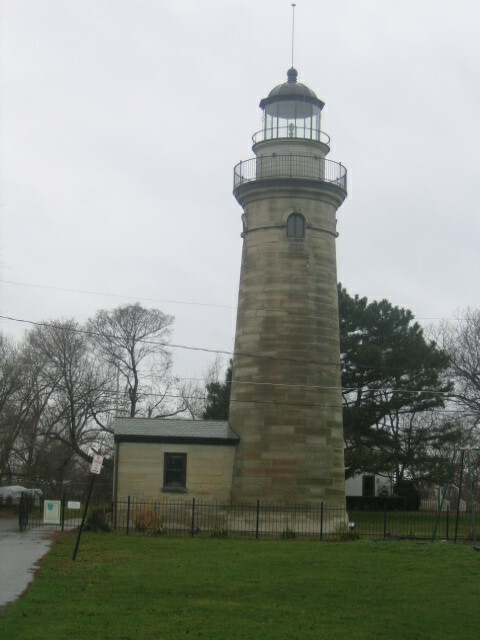 Stop number one at Erie was a lighthouse we’d stood practically under but never saw.. the Erie Land light. We had seen the light out at the far tip of Presque Isle, a couple years past and you can see this smaller light from the spot of the larger one… but for reasons I don’t understand, other than perhaps the weather, we never saw the larger light looming over us. The lantern room at the top of the tower, is a re-construction, since the thing was originally removed around the turn of the century when it was retired for the second time. The thing looks great for a building with 1867 written on the cornerstone. There’s a playground there along with a lot of history, and a really fine view. I could see spending a few hours here on a warm summer’s day. If you’re in Erie, it’s worth the stop. 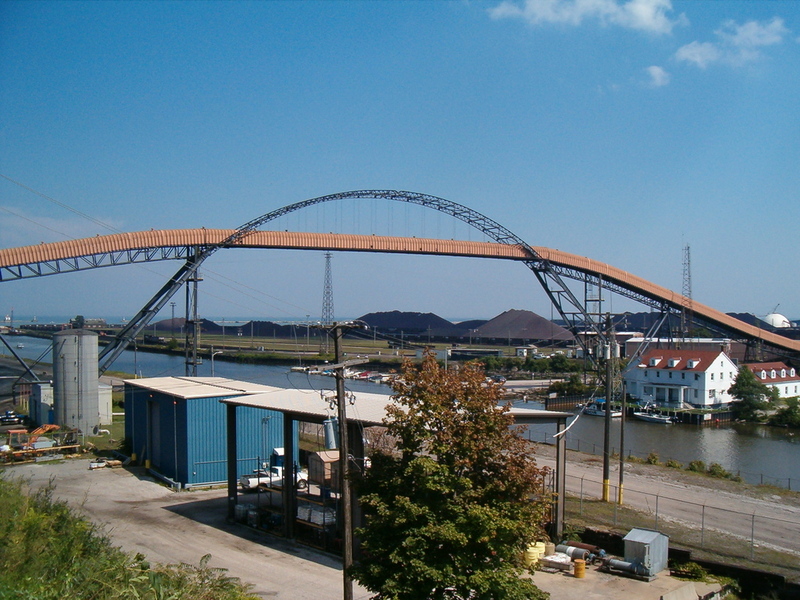 From there, we were off to the Erie test track, which is where the new power we’d seen at Ashtabula was built, and tested. I’ve written about this place before; It’s a favorite stop. Nothing on the test track today, but we did manage to get lots of freight traffic on film… well, on flashcard, anyway. From there, a short hop to home. So, now you know where I was on Saturday.